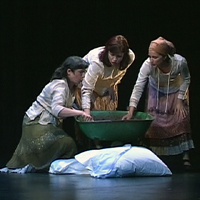 For thirty years, the all-female vocal group Kitka has performed music rooted in Eastern European musical traditions. In a recent trip to rural Ukraine, they studied Slavic folk songs that previously existed only in the memories of an older generation of local women. Spark joins Kitka as they rehearse and perform a new performance based on the songs and stories that were passed down to them. Next, the mixed-media work of Santa Cruz artist Victoria May is inspired by the intricate process of custom dress-making. A former seamstress by trade, May now makes sculptural textile pieces that blend traditional hand sewing techniques with evocative and unexpected materials. Then, in a special collaboration with The NewsHour, Spark presents an investigation into the arts and the economy. 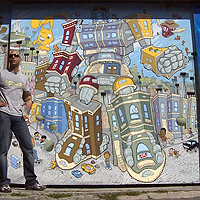 How are local artists coping with the economic downturn? Some scholars and activists think hope lies in government support. What can we learn from the historic WPA programs that provided employment for 8.5 Million Americans during the 1930s? Join The NewsHour in an investigation on how local artists (including Sirron Norris and Carla Blank) are coping with the economic downturn. 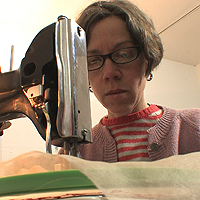 Visit with Victoria May in Santa Cruz as she makes sculpture from thread, needle and cloth.